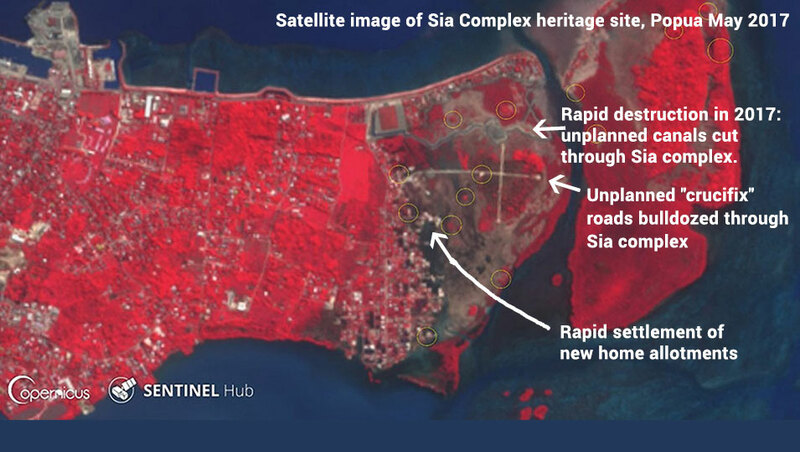 Less than two years after promising to protect the complex of Sia Heu Lupe and related mounds in Popua, the Tongan government has deliberately destroyed it. Sia Heu Lupe is a 600-year-old heritage site on shallow tide-water and reef lands in Tongatapu. Prime Minister ‘Akilisi Pohiva has refused to state where the money for the subdivision that is replacing the heritage site has come from. He denies that any plans exist or that environmental studies or open bidding were needed to begin construction. 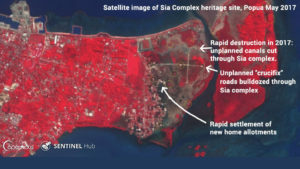 Latest satellite imagery shows how the rapid development at Popua, Tongatapu, is destroying the Sia Complex heritage site. May 2017. Matangi Tonga Online. In recent months, work crews have bulldozed the site to create roads and dug deep canals. The government has also encouraged immigrants from outer islands to settle and build homes on shanty-town lots in what is in actuality, a swamp. The development is in a low-tidal, exposed reef area, and the lagoons are now full of debris and pollution. Heavy machinery has torn apart the ancient stone platforms and walkways belonging to early ritual sites called Sia. 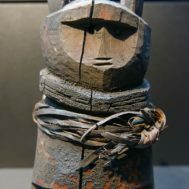 These Sia functioned both for pigeon-snaring, a royal sport in Tonga, and are at the same time, associated with the Tongan creation story. In May, earth moving equipment was used to level off the top of a Sia and crews set up a work-site on top of it. Among comments by the Prime Minister and government ministers who are behind the destruction are, that as there are no more pigeons in the region, the ancient mounds are no longer of any interest. Tongan business people, academics and concerned citizens, formed the Tonga Heritage Society in August 2015 around concerns about uncontrolled development at the unique Tongan archaeological site. In August 2015, members of the Tongan Heritage Society delivered a petition calling for preservation of the ancient Sia complex signed by 700 people to Tonga’s parliament. A possible correlation between the layout of the ancient complex of pigeon snaring mounds and walkways on the lagoon edge of Tongatapu and the Associated star constellation Mataliki (Pleiades). Compilation images courtesy of Shane Egan and the Tonga Heritage Society. Matangi Tonga Online. The Sia complex has attracted scientific study by researchers since the 1920s, when archaeologist W.C. McKern first investigated the site. Dr. Dirk Spennemann, an Australian professor and cultural heritage specialist did extensive work in Tonga in the 1980s. Dr. David V. Burley of Simon Fraser University in Burnaby, British Columbia, has done field archaeological research in Tonga since 1989. 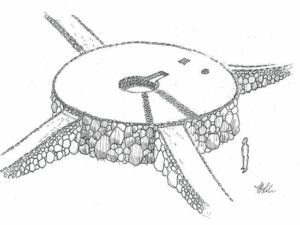 “The main stone-faced sia has ramps that go off from the hub in spokes to different sites over the reef – including one area that is already built over by housing. “Four arms lead to causeways radiating each to a different sia, although we couldn’t find what was on the end of one,” he said. By early June 2017, only one Sia, the most important, was still standing undisturbed. Before the apparently illegal construction, there had been about 14 known interconnected mounds (once stone circles) with connecting raised walkways. They dated to about 1400 AD, and are thought to have been constructed by a powerful ruler, who could command his people to move some 4000 tons of rock by hand to build the mound and walkway complex on the tidal area. Drawing of central mound by artist Sioeli Filipe Tohi. Matangi Tonga Online. “It’s a really important piece of archaeological heritage that is within the confines of Nuku’alofa that could be made a national historic site with a stroke of the government’s pen. 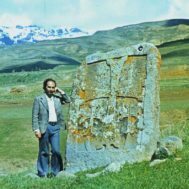 For this mound, in particular, they could put a buffer around it – so there is no development out here and they could put a sign on it that says if you take the stone away you are in serious trouble. A fascinating aspect of the site – as it was – is the apparent relationship between the ancient mounds and the appearance of the Pleiades in the Tongan night sky. 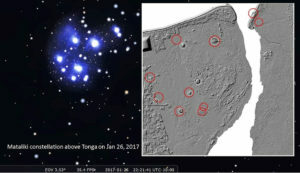 Researchers Ka’ili and Shane Egan have recently shown a possible correlation between the positions of the mounds and this important constellation (known in Tongan as Mataliki), which was used by Tongan navigators to cross the seas. The explanation for the construction by government has varied greatly from one press announcement to the next. It now appears that there may be yet another agenda for development in the area. In January 2017, the government announced creation of a 10 acre Va’epopua National Park around a former garbage dump, near to but not including the ancient archaeological site of Va’epopua Sia Heulupe. The ancient site seemed to have been deliberately excluded from the new national park. Tree roots protect a raised walkway leading to sia heu lupe – a chiefly pigeon snaring mound built circa 1400 AD, with stone retaining walls and a central stone lined pit that was used for an unknown purpose. The pit is 4-6 feet deep and large enough to shelter many people . Va’epopua 1 August 2015. Matangi Tonga Online. A mysterious golf course, but who is paying for it? Then, in early May 2017, in a bizarre press conference, Prime Minister ‘Akilisi Pohiva announced that a large development project than included canals and a golf course was ongoing at the site under his sole authority, and that member of Parliament ‘Etuate Lavulavu, who had been one of two parliamentarians to oppose the petition to protect the area, was supervising the new project. 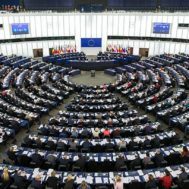 Lavulavu, contradicting the Prime Minister’s statement that there was no plan for the projects, said that overseas designers had come in earlier and worked for two weeks on a golf course design. Funding is also a mystery. The project started with $10,000 that was donated from “outside,” according to the Prime Minister. “There is no plan, no working committee. We just work outside,” he said. Lavulavu announced that funds were coming from Public Enterprises, the Harbour Board Authority, the Water Board and the Power Board, but said there was no accounting and nothing written down. 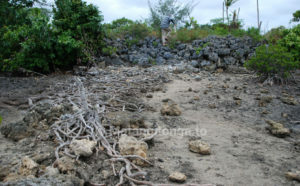 Meanwhile, members of the Tongan Heritage Society expressed shock and dismay at the president’s betrayal and the irreplaceable loss of the stone elements at the site They called for a halt to development, immediate intervention by archaeological site specialists, and setting the area aside as a reserve so that that the tidal marine environment and mangroves can at least be saved. An organizer of the 2015 petition, Dr ‘Ana Koloto, said she was praying for divine intervention – since the Prime Minister seemed determined to destroy the heritage site. In 2017 the PM’s Popua development has turned an ancient Sia into a roadworks depot. 14 May 2017. Matangi Tonga Online.